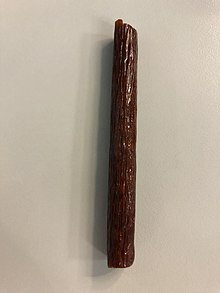 The Slim Jim was first invented by Adolph Levis in 1929 in Philadelphia, although he and his partner subsequently hired a meatpacker to develop the product for production in the 1940s. He later sold the company in 1967 for about $20 million to General Mills, who moved the operations to Raleigh, North Carolina, and merged them into other meatpacking operations that it renamed Goodmark Foods. He sold Goodmark in 1982 to a group led by Ron Doggett. ConAgra bought Goodmark in 1998. The product Levis created is different from the one produced since the 1990s, with Lon Adams developing the current Slim Jim recipe while working for Goodmark. Slim Jim is an example of a food product which is listed as containing mechanically separated chicken in its ingredients by requirement of the USDA. From 1993 to 2000, advertising for the product included commercials that featured professional wrestler "Macho Man" Randy Savage, who served as spokesperson. Each commercial would close with Savage bellowing "Need a little excitement? Snap into a Slim Jim!" Other notable spokespersons have included rapper Vanilla Ice and wrestlers The Ultimate Warrior, Bam Bam Bigelow, Kevin Nash, and Edge. The advertising campaign was developed at North Castle Partners in Greenwich, Connecticut, by Tom Leland and Roger Martensen, under the creative direction of Hal Rosen. The "Snap Into A Slim Jim" concept was originally intended for comedian Sam Kinison, but he declined. Hal Rosen then suggested using WWF wrestlers, and The Ultimate Warrior was selected for the kickoff spot. In addition to a TV spot, the Ultimate Warrior also recorded several radio commercials for Slim Jim in 1991. A subsequent campaign featured Slim Jim Guy (played by actor Demetri Goritsas) in a giant Slim Jim costume, demanding "Eat me!" These ads personified the irreverent personality of the brand and were also from North Castle Partners. Slim Jim advertisements were also heavily featured on MTV, ESPN, WWF, and Disney Channel. Slim Jim was one of the earliest sponsors of the ASA Pro Tour (the aggressive inline skating tour) from 1997 - 2000. The ASA Pro Tour was a qualifier for ESPN's X Games. In 2005, Slim Jim advertising featured the Fairy Snapmother, described in a ConAgra press release as "a character resembling a tattooed rocker with wings - and a familiar MTV-type of humor young males enjoy." Another campaign depicted hunters hunting a fictitious "Snapalope" within convenience stores using urban camouflage. The Snapalope is a deer-like puppet made from Slim Jims. In 2008, Slim Jim launched the website "SpicySide.com", encouraging consumers to get in touch with their "Spicy Side" by creating an avatar and fighting their friends in an online landscape called Spicy Town. Slim Jim also partnered with a well known Machinima artist Myndflame to develop a World of Warcraft parody. Slim Jim sponsored Bobby Labonte and David Green when they won the NASCAR Busch Series championship in 1991 and 1994, respectively. A 2009 Wired article listed some of the ingredients as beef, mechanically separated chicken, lactic acid starter culture, dextrose, salt, sodium nitrite and hydrolyzed soy. They note that although ConAgra refers to Slim Jim as a "meat stick", it resembles a fermented sausage, such as salami or pepperoni, which uses bacteria and sugar to produce lactic acid, lowering the pH of the sausage to around 5.0 and firming up the meat. Sodium nitrite is added to prevent the meat from turning gray, and hydrolyzed soy contains monosodium glutamate. Slim Jim has launched several spin-off products of its main brand. These products are often of higher quality than the original Slim Jim, using premium meats. Such products include both tender steak strips and beef jerky. The tender steak strips come in three flavors. Its companion beef jerky comes in three flavors: an original flavor and two spicy flavors. ^ LaVito, Angelica (October 13, 2017). "Conagra is revamping the Slim Jim brand: Think office, not gas station". CNBC. Retrieved December 29, 2017. ^ Trotter, Greg (November 16, 2016). "Slim Jim knows you've given up its meat sticks, and it wants you back". Chicago Tribune. Retrieved December 1, 2016. ^ Lauria, Peter (July 2, 2009). "Where's the Beef?". New York Post. ^ a b Hansell, Saul (March 25, 2001). "Adolph Levis, Entrepreneur And Philanthropist, Dies at 89". The New York Times. The New York Times Company. Retrieved 7 September 2015. ^ "Ron Doggett". NC Business Hall of Fame. North Carolina Business History. ^ "ConAgra Inc. buys GoodMark Foods Inc. for $225 million". Triangle Business Journal. American City Business Journals. February 15, 1999. Retrieved December 1, 2016. ^ "Slim Jim: Present at the Creation". The New York Times. July 28, 1996. ^ "Slim Jim Monster Smoked Snacks, Original, 1.94-Ounce Sticks (Pack of 18) by Slim Jim". Amazon.com. Retrieved December 1, 2016. ^ "Slim Jim maker closes Garner plant Friday". WRAL.com. Retrieved 8 February 2015. ^ "1997 ASA Pro Tour Sponsors - Thank You!". aggroskate.com. Archived from the original on 14 May 1998. Retrieved 8 February 2015. ^ "SNAP! Slim Jim's Fairy Snapmother Flies Into Convenience Stores" (Press release). ConAgra Foods. November 15, 2005. Retrieved 2008-09-08. ^ a b c d Di Justo, Patrick (24 August 2009). "What's Inside a Slim Jim?". Wired. Archived from the original on June 29, 2013. ^ "Slim Jim beef jerky". Snack Memory. Retrieved 8 February 2015. Wikimedia Commons has media related to Slim Jim (snack food). This page was last edited on 13 April 2019, at 00:39 (UTC).